This is the 2nd annual concert, celebrating the 69th independence day on its eve to promote Korean culture. Janchimadang prepared this concert to be a communication among fusion gugak, hard rock and classical vocals (western). This was a selected piece at 2013 National Gugak Center ByeolByeol Yeonhui contest. It has been invited to International Folk Festival in Estonia & Lithuania, to the tour concerts in 4 Northen Europian cities and at Mexico Zacatecas International Folk Music Festival(CIOFF) representing Korea. Janchimadang said 'It will be a good experience and memory for the people from young children who were craving gugak concerts during summer vacation to elders who have hazy memories of the independence. 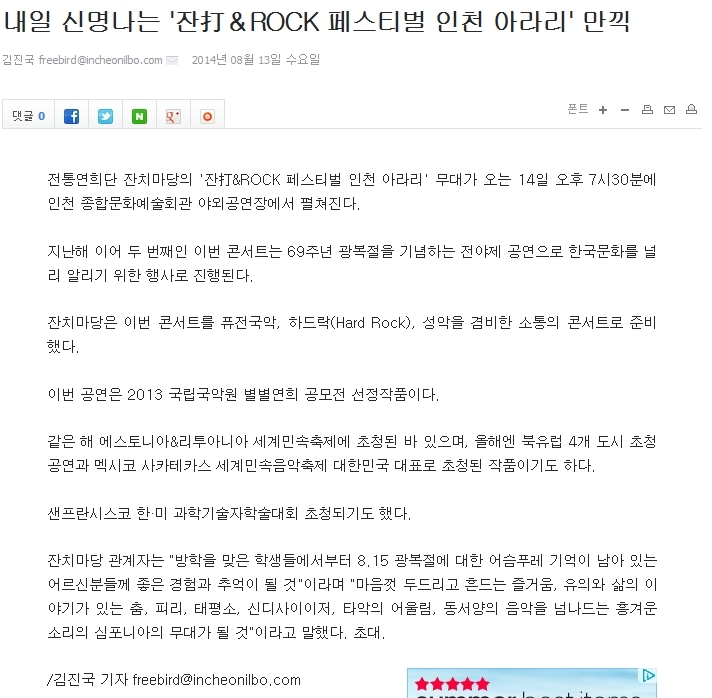 Ta & Rock festival 'Incheon Arari' will be a symphonic stage of fun beating, dance with life stories, the harmony of piri, taepyeongso and synthesizer, and joyful music moving back and forth the Asian and Western music.'. Invitation required.